Pepe Le Pew & Penelope In Love | Alley Cats Retired Figurines | One Price Low Flat Shipping! 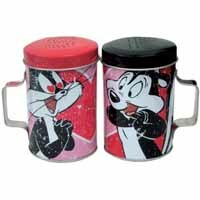 From Westland Giftware's Looney Tunes Kitchenware Collection, Pepe Le Pew and Penelope Tin Salt & Pepper Shakers Set. Made of tin. Measures 4" tall. Handwash only. This officially licensed Looney Tunes salt and pepper shakers set has a retro flavor to it, with one shaker featuring everybody's favorite skunk, Pepe Le Pew, and the love of his life, Penelope, on the other! Tweety, Bugs Bunny, Sylvester, and friends are the stars of this line of bobbleheads, trinket boxes and figuines. From Tweety and Sylvester's mugs and shaker sets to Pepe Le Pew and Penelope riding on a motorcycle, you'll enjoy the famous fun of these retro Looney Tunes characters!